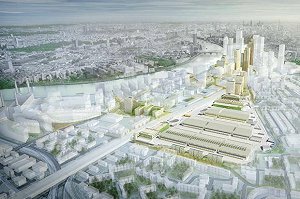 Construction is due to commence on the £2bn New Covent Garden Market site in London this coming summer. The site is to receive a facelift at the cost of £2bn. The regeneration project is being led by Vinci and St Mowden in a 50/50 joint venture. Vinci St Mowden (VMS) were selected in 2012 to lead the delivery of the project after a procurement process started in March 2010. The London Borough of Wandsworth granted planning permission for the scheme last year. The new market – to be renamed The Garden - will be funded in part by releasing land not needed for core market trading for development. The existing market currently trades on 57 acres and will be consolidated into 37 acres, freeing up 20 acres of surplus land. The scheme, situated next to Vauxhall Cross in the Nine Elms regeneration zone, is expected to take around ten years to complete and the final result will include 550,000 sq ft of modern office facilities to house the 200 businesses that make up the market. A new fruit and vegetable market will be the centrepiece of the scheme. 3,000 homes (including affordable housing), a multi-storey car park, 135,000 sq ft of commercial accommodation, 1,000sq ft of retail, leisure and community facilities will be built. The transport secretary has approved a £1bn connecting underground line to serve the area, expected to open by 2020. Two new stations will open: Nine Elms to the east, and one near to the Battersea Power Station redevelopment. The market will continue to trade throughout the building process.